Last year, the film adaptation came out. I remember the frenzy when everyone was reading the book; it was highly recommended by folks I deeply respect and admire. I intended to read it. And when the movie came out last year, I fully intended to see it, also based on the recommendations of trusted friends. But it was on a movie channel this weekend, and I watched it. Than I watched it again with my husband. Now, I’m offering this “travelogue” of my time at The Shack. Disclaimers: This is not a movie review. And since I never read the book, I can’t speak to how faithfully the book translated into the movie. Where I diverge from the Fundamentalists is the motive behind all their pulpit slamming, hand-wringing and pearl clutching. I think at the core of this "righteous" over-reaction is just another ever-vigilant crusade to protect their understanding of God as the only way to know/understand God—their usual M.O. and raison d'être. At least the film presents us with a God who loves, embraces and welcomes everyone...and insists humans do the same. Fundamentalists like the power to say who is worthy of love and acceptance and who is not. The God of The Shack is forgiving and merciful, and calls those who know God to forgive and show mercy. That is not the God of Fundamentalism! I see Fundamentalists who want to wrangle over a movie that doesn't represent their theology, while enthusiastically supporting a president who lives his life, cobbles an administration and promotes policies that are completely contrary to the Jesus of their faith. (But that's been covered in other posts, hasn't it?) Why is "theology" so crucial to a movie, but when it comes to how we treat other people in need? (cf: Matthew 25: 31-46) Shouting at a movie, but remaining silent in face of the "godless" behavior by this administration tells me their outrage is hypocritical, and proves their "theology" is flawed. But yes, Fundamentalists are correct: there is theology at the core of this story. In fact, lots of different theologies. And it’s true this movie definitely veers sharply from the core beliefs of conservative Biblicists. Mack Phillips had a rough childhood with a brutal, abusive father. Mack also did a terrible thing, but has been able to overcome his past and create a stable life with his wife and three children. On a camping trip, his youngest daughter Missy vanishes, the victim of a serial killer who abducts and murders young girls. Her body is never found, but they find her torn, bloody dress in a remote, dilapidated cabin in the mountains. The Shack! It’s signed Papa, his wife’s favorite name for God. Then Mack arrives at…The Shack. But this one is fully restored, lovely and inviting. And it’s occupied! Yes, it’s the Trinity—Father, Son and Holy Spirit. The Three brought Mack there to help him deal with the death of his daughter, his guilt for his failure to protect her, his waning faith, and his bitterness toward God who allowed it. There are many hard questions asked in this movies. (e.g., Why does God allows such tragedies? How can God be good when there is evil in the world?) There are questions about suffering, pain, sin, faith, forgiveness, and the nature of…the very existence of…God as loving and omniscient. This movie does not (NOT!) solve those problems or provide answers; I’m not sure that’s the intention. (Or if that's even possible! People of faith and learned theologians have been wrestling with those questions for centuries.) In fact, when Mack brings up God's wrath to Papa, he/she dumbs down, as if he/she has never that issue before. Really? Not much omniscience there. To be fair, the movie clearly states that healing doesn't come instantly, and forgiveness, which is a choice, can take years. Having come from a Fundamental background, with those rigid preconceptions and indoctrinated concepts, I understand why this movie would be unnerving and challenging. (One writer was outraged that God was a black woman. Not sure which offended him most—that God was a “she” or that she was black.) I'm sure an Asian female as the Holy Spirit is equally disconcerting, though in the original language, the word for "Spirit" is feminine. What does The Shack want to be? We hear pithy analogies, trite platitudes and thoughtful quotes, some that I’ve included at the bottom. At one point, Mack asks Papa/God to stop talking in riddles. I agree! I compare it to my husband's “kitchen sink stew,” made from things that, individually, would appeal to the tastes of many people—carrots, potatoes, onions, meat, tomatoes, mushrooms. But when they’re cooked all together, it might not be as palatable for everyone at the table. There are seriously heavy themes, but not many equally deep answers. In fact, when Mack brings up God's wrath to Papa, he/she dumbs down, as if he/she has never that issue before. Really? Not much omniscience there. I doubt an atheist watching this movie will be converted. An agnostic won’t come away with greater certainty, one way or the other. 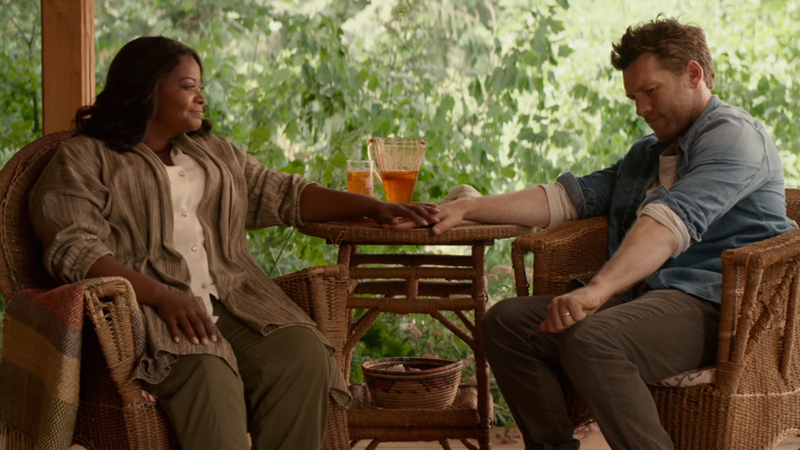 On the positive side, I believe the movie pushes us to think, to ask questions about difficult topics, and to struggle past simplistic answers. Faith is not supposed easy, with rote answers of cut-and-pasted Bible verses. Doubt is not a bad thing. Personal Note: That’s what happened at our house. My husband and I were able to have a conversation about concepts like death and what happens afterwards. As I face my current, ongoing battle with cancer, I want these conversations about my assurance of God's work, and my faith about eternity. 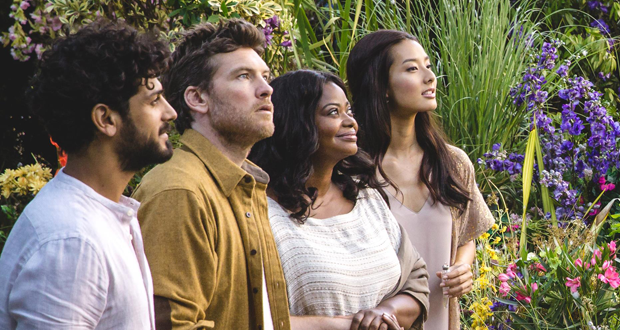 While The Shack can be heavy-handed at times, even emotionally manipulative, at least it doesn’t come with the conservative agenda of many recent “religious” films, like Miracles from Heaven, Left Behind, A Case for Christ, all the iterations of God is Not Dead, ad nauseam. Anthropomorphizing God (assigned human elements to the divine) is difficult. When Mack first sees Papa, she's the personification of someone who was very kind to him when he was a child, beaten up his father. To me, the Bible is a library of people relating how they experience God. Sometimes God is harsh and vengeful; other times, God is merciful and forgiving. I don’t think the records should be seen as complete depictions of God, but as honest reflections of how God is perceived at any given time, by various people, in a variety of circumstances, throughout history. Perhaps God is willing to meet us wherever we are ready, and in whatever form our heart can handle. There was some thoughtful parts of the movie that intrigued me, inspired me and impacted me. Mack’s time in the Cave of Wisdom was enlightening. I like that the God of The Shack is welcoming and embracive. I appreciate that God is free of gender confinements. Mack's conversations and interaction with Jesus were so gentle, and human. Mack’s walk with Sarayu/The Spirit in the garden. He thinks it’s overgrown and out of control. Sarayu sees it as beautiful. Sarayu tells Mack the garden is his life. Then the camera slowly moves up and we get an aerial view. From up there, we see there's order, and pattern, and paths. As a person of faith, I believe that in those times when I think my life is a total mess and out of control, it’s only because my perspective is limited. I'm too close to see it all! He tries to suppress his anger, guilt and bitterness, but they will not be ignored. For Mack, that involved a decision to return to the shack. To acknowledge the tragedy. Meet it head-on. Same with us, I think. In our heart and mind, we must honestly confront our pain, our mistakes, our fears, our tragedies. Trying to solve the symptoms is like taking an aspirin for a brain tumor. 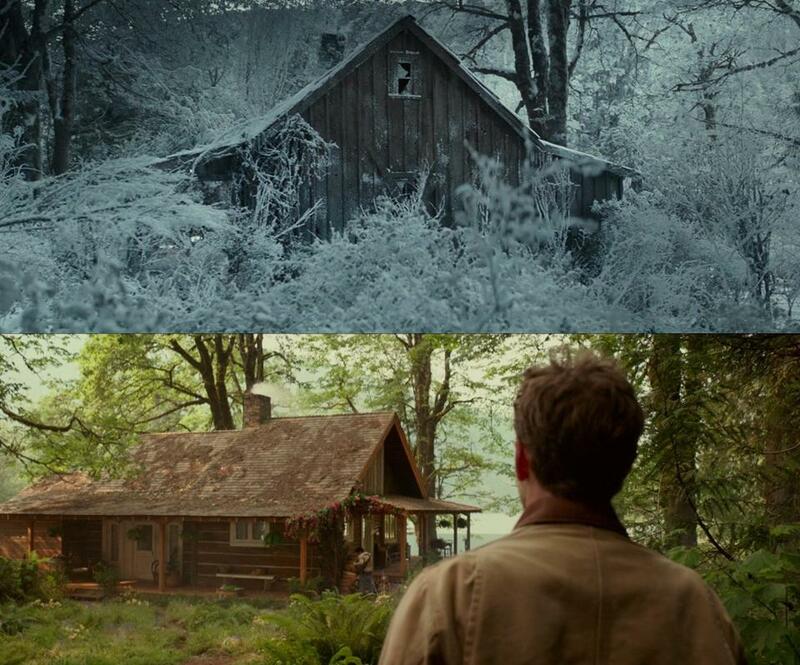 Perhaps to experience forgiveness and healing, we have to go back to our Shack—the very place where it all began. Watch the movie for your own insights, and draw your own conclusions. 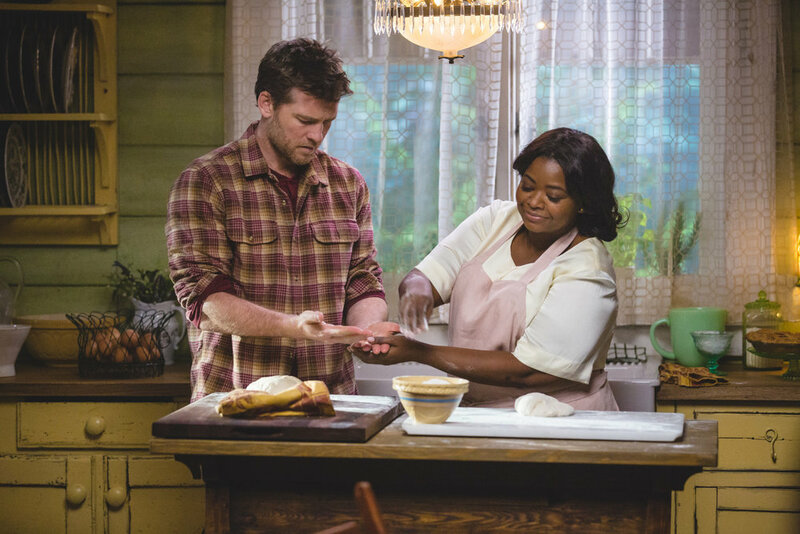 For me, when all is said and done, I personally like the idea of god as a black woman who makes homemade biscuits. "You have no idea how much I love you." “Pain has a way of twisting us up inside and making us do the unthinkable." "When all you see is your pain, you lose sight of me." "You were created to be loved! If pain is left unresolved, it will keep you in this spot and you will forget what you were created for!" “Just to be clear. We're not justifying anything. We'd like to heal it, if you'd let us." "There are billions [of people] each determining what you think is good and evil. And when your good clashes with your neighbor's evil, arguments ensue, wars break out...because all insist on playing God. You weren't meant to do any of that all on your own. This was always meant to be a conversation between friends." "You are important, and so is everything you do. "I'm the best way any human can relate to Papa and Sarayu. To see me is to see them." "Love is meant to exist within a relationship...That's all we to have with you. Even if you can't see it, you are in the center of our love and purpose. As beautiful as [the galaxy] is, it's nothing compared to how we see you." "Religion is way too much work. I don't want slaves, I want friends. Friends to share life with!" "Every time you love, or forgive, with every act of kindness, the universe changes...for the better."